Egyptian Foreign Ministry blames Israel for clashes in Jerusalem, urges it to “stop the escalation”. The Egyptian Foreign Ministry on Friday blasted Israel over the clashes in Jerusalem and the area, urging the Jewish state to “stop the escalation”. In a statement, Cairo called on Israel "to prefer the voice of reason in order to avoid being dragged into a dangerous swamp that would be difficult to get out of and that could eliminate the efforts being made to encourage Israel and the Palestinians to renew negotiations." The Egyptian Foreign Ministry demanded that Israel immediately stop the "violence and escalation against the Palestinians in Jerusalem and the Al-Aqsa Mosque," and expressed its concern that Palestinian Arabs were killed and wounded in clashes with the security forces. 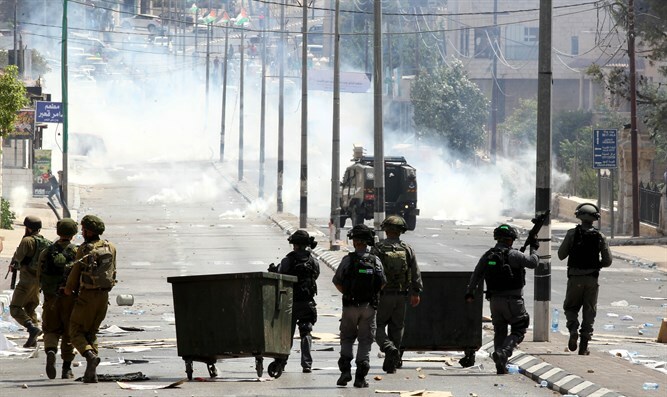 The statement called the victims "innocent Palestinians" and claimed that "excessive force" had been used against them, according to Yediot Aharonot. Cairo further stressed that Israel must respect the sanctity of religious sites and the Palestinian Arabs' right to practice their religious rituals in freedom and security, "without steps or restrictions that inflame the anger of the Palestinian people and the Islamic nation as a whole." The harsh rebuke from Egypt came after four Palestinian Arabs were reportedly killed and dozens wounded in clashes between protesters and Israeli forces over the new security measures at the Temple Mount compound. The clashes began after the Cabinet decided overnight Thursday that the magnetometers will remain at the entrance to the Temple Mount as part of the new security measures at the compound. The Cabinet also authorized the police to make every decision "in order to ensure free access to the holy places, while maintaining security and public order" on the Temple Mount. The magnetometers were placed at the site following last Friday’s terrorist attack at the complex, in which two Druze policemen were murdered.